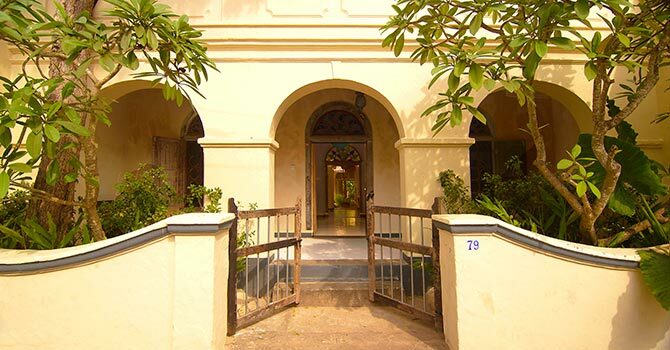 A breezy 4-bedroom house villa by the beach in this fort town in southern Sri Lanka. A charming home in a beautiful setting. Nestled amongst a lush tropical garden, this 3-bedroom luxury villa enjoys a beautiful pool and meditation pagoda, in Ahangama. Enjoying a prime position atop a hilltop, this stunning and modern 3-bedroom luxury villa is nestled on the edge of peaceful Welligama Bay. 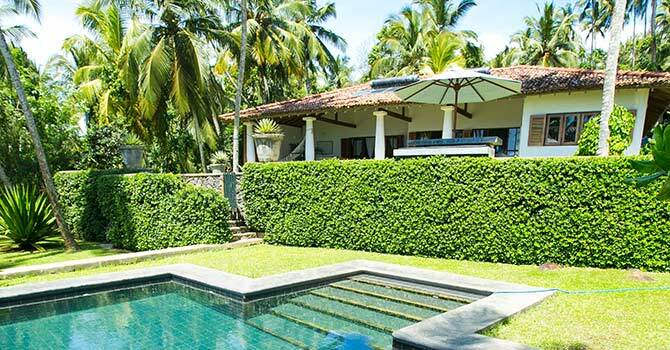 Overlooking the rugged coast of Dikwella in Sri Lanka's south, this modern 3-bedroom luxury pool villa is just a 5-minute walk from the beach. Located close to the historic fort town, this beautiful 4-bedroom villa in Ahangama is close to the beach and features a large swimming pool. While it may not have the global reputation of some other Asian beach hotspots (yet), Sri Lanka is a definite up-and-comer, arriving on many 'must see' lists in recent years. This will not surprise anyone who has visited Sri Lanka - the stunning emerald isle is cloaked in rich foliage, with stunning coastal beaches and buckets of arts and culture. 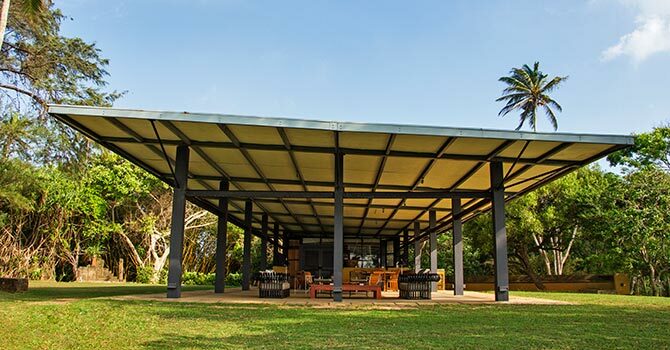 It's no wonder that every year, more visitors arrive for stays in beautiful villas in Sri Lanka, taking in the amazing landscapes from jungles to beaches. Plus, Sri Lanka retains an unspoiled, authentic charm that makes you feel like you have just discovered a well-kept secret. Perhaps it's a cliche, but it's best to discover Sri Lanka soon - before the rest of the world does. Sri Lanka is a relatively small island, but it is full of incredible things to do. For holidaymakers wishing to take advantage of the island's beautiful beaches, southern Sri Lanka is your best bet. The most well-known town in the area is Galle, which is best known for its sixteenth century fort, and today is home to an increasing number of cafes, shops and restaurants. Although development is arriving, the area remains charming, with cobbled streets and Dutch colonial homes. The most popular past-time for locals here is the glorious sport of cricket, so it's well worth trying to catch a game, whether it be amongst enthusiastic amateurs or perhaps an international match. The coastline is beautiful, and you can't help but fall in love with its incredible tropical surrounds, soft white sand and clear azure waters. A former fishing area, life here is laidback and relaxed, and you can feel your troubles melting away with every minute you spend relaxing on the beach. As you continue along the coast, the landscape becomes even more unspoiled and wild, reminding you of the enormous untamed beauty of nature. Tangalle is another hub for holiday makers who decide to visit the southern coastline, with a selection of cafes, shops and restaurants. Here, you can sample traditional Sri Lankan cuisine - which is truly delightful - or perhaps indulge in a fresh seafood feast. Wherever you may stay the southern province of Sri Lanka has a habit of making all your troubles simply drift away - it's so beautiful you may just wonder where all the crowds are. 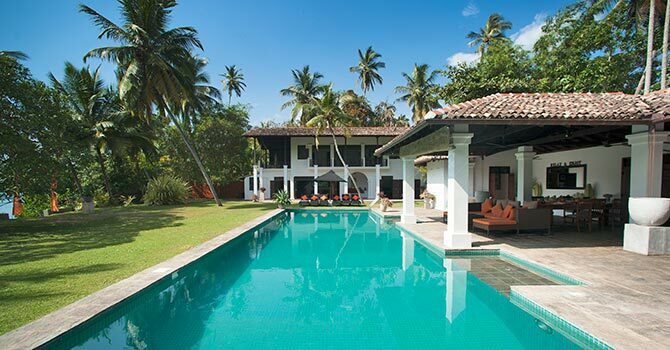 While it is the beaches that draw most visitors to Sri Lanka - and for good reason, especially as there are many beautiful Sri Lanka villas with access right out onto their stunning shores - there is a lot more to do, as well. Sri Lanka's rich landscape has allowed many different species of animals to flourish, and they enjoy protected status in the beautiful national parks. Within close reach of Sri Lanka's south coast is Yala National Park, the country's second largest nature park. With wide open spaces and rice paddies, the national park is home to many different animals such as elephants, buffalo and monkeys. The luckiest of visitors to Yala National Park may even spot a jaguar in the wild - a truly incredible sight. Sri Lanka also has a number of famous exports which are even better when enjoyed in the country. Most famously, Sri Lanka - once known as Ceylon - has long been known for its exceptional tea, and there are many plantations to visit. The delicious tea is a great souvenir, and very affordable. The island is also rich in gemstones, including most famously sapphires. In fact, many Sri Lankans will proudly tell you that the famous blue sapphire in Princess Diana's engagement ring was sourced from Sri Lanka. You can feel like a princess yourself if you pick up some beautiful jewellery to remind you of your time here. You may also like to visit some of the other places, especially if you are flying in and out of the capital Colombo. One favourite is Kandy, about a hundred kilometres from the capital, with its focus on arts and culture, and the beautiful 'Temple of the Tooth'. After spending some time relaxing beachside, you may again find yourself wondering if it is only a matter of time before the secret gets out, and Sri Lanka gets the tourist traffic it deserves. In the meantime, sit back, relax and take in the unspoiled beauty of this island paradise. 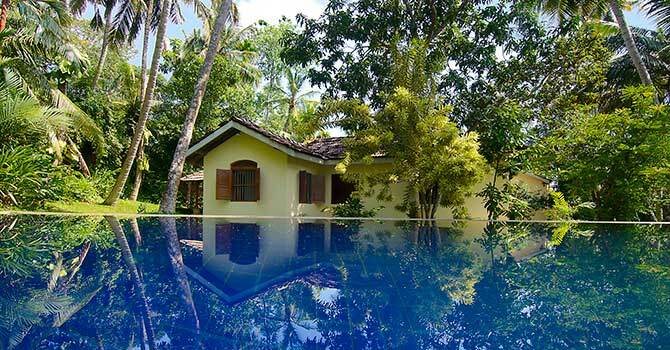 The good news is that they are much more affordable than the more visited villa vacation destinations in Asia. And due to the stage of development of the country the villas tend to offer more privacy and often better views and access to the beachfront. The villas are often less glamorous and more authentic, with federation architecture and the feel of a real villa estate. They are also less busy as there are far fewer, they are not located in popular villa estates but rather standalone, and most do not have staff unless you have made particular arrangements for such. Sri Lanka is a less busy version of the south east Asian islands with palm fringed beaches and a relaxed atmosphere. It also shares the climate on it’s southern coastline meaning that the best time of year to visit for dry and warm weather is December to March. Be advised because there are not so many villas here and the growing popularity of the country tourism means it is a very good idea to book well in advance for these busy months. You will need to apply and receive a tourist visa prior to your arrival which is very easy to do online, the visa provides a 30 day stay duration.